Equipping you to lead all-age services over Advent the period, these sketches, talks, activities, and lessons will inspire you to celebrate Christmas with everyone! Want to engage all ages this Christmas? Brand new, up-to-date, fresh and exciting ideas from Scripture Union! Celebrate Christmas in style with crafts, dramas, prayer ideas, family fun day outlines, all-age talks and much, much more, All of the content is especially designed to work in any context. Great resources for all-age services, small groups, children's groups, youth groups – and even in school. The Christmas story is one of the most important parts of the Christian faith, and these resources bring it alive in engaging and inspiring ways. Take a look inside to find out more! 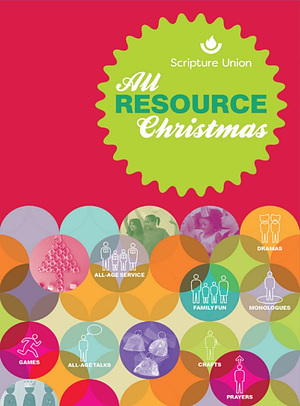 All Resource Christmas by Scripture Union was published by Scripture Union in August 2017 and is our 2306th best seller. The ISBN for All Resource Christmas is 9781785065590. Be the first to review All Resource Christmas! Got a question? No problem! Just click here to ask us about All Resource Christmas.